This test is performed by an ophthalmologist or optometrist. Both of these professionals are often called "eye doctor." You sit in a chair that has a special device (called a phoroptor or refractor) attached to it. You look through the device and focus on an eye chart 20 feet (6 meters) away. The device contains lenses of different strengths that can be moved into your view. The test is performed one eye at a time. The eye doctor will then ask if the chart appears more or less clear when different lenses are in place. If you wear contact lenses, ask the doctor if you need to remove them and for how long before the test. This test can be done as part of a routine eye exam. The purpose is to determine whether you have a refractive error (a need for glasses or contact lenses). If your uncorrected vision (without glasses or contact lenses) is normal, then the refractive error is zero (plano) and your vision should be 20/20 (or 1.0). A value of 20/20 (1.0) is normal vision. This means you can read 3/8-inch (1 centimeter) letters at 20 feet (6 meters). A small type size is also used to determine normal near vision. You have a refractive error if you need a combination of lenses to see 20/20 (1.0). Glasses or contact lenses should give you good vision. If you have a refractive error, you have a "prescription." Your prescription is a series of numbers that describe the powers of the lenses needed to make you see clearly. If your final vision is less than 20/20 (1.0), even with lenses, then there is probably another, non-optical problem with your eye. You should have a complete eye examination every 3 to 5 years if you have no problems. If your vision becomes blurry, worsens, or if there are other noticeable changes, schedule an exam right away. After age 40 (or for people with a family history of glaucoma), eye exams should be scheduled at least once a year to test for glaucoma. Anyone with diabetes should also have an eye exam at least once a year. People with a refractive error should have an eye exam every 1 to 2 years, or when their vision changes. Feder RS, Olsen TW, Prum BE Jr, et al; American Academy of Ophthalmology. Comprehensive adult medical eye evaluation preferred practice pattern guidelines. Ophthalmology. 2016;123(1):209-236. PMID: 26581558 www.ncbi.nlm.nih.gov/pubmed/26581558. Scott CA. Testing of refraction. In: Yanoff M, Duker JS, eds. Ophthalmology. 4th ed. Philadelphia, PA: Elsevier Saunders; 2014:chap 2.6. 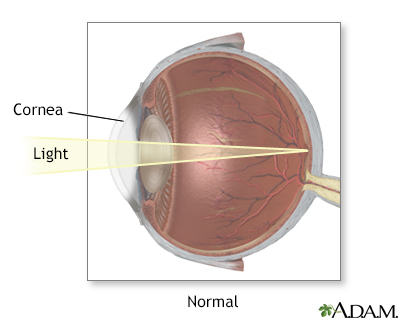 Normal vision occurs when light is focused directly on the retina rather than in front or behind it.